Some Chinese philosopher once said that even the longest journey begins with a first step, and boy has it taken a long time to achieve even that. We have after all been talking about digital switchover ever since the first digital satellite broadcasts began in 1999. Our journey from the analogue terrestrial TV realm to the digital one has now begun in earnest and it’s going to affect every person and household in this country by the time the whole process is complete in 2012 (with the exception of the Channel Islands, which will go digital in 2013). 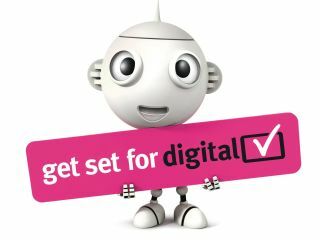 The UK Government - through its Digital UK agency - is rolling out digital TV broadcasts across the country on a region by region basis, something that should hopefully give you time to get the help, advice and equipment you need to make sure that you’re ready. This quick guide should help you get started. 1. When will you need to be ready? Digital UK has set out a plan for switchover based on the 14 ITV regions that we have now based on population density. That means the ITV area of Borders goes first with highly populated areas like London, Tyne Tees and the Central region coming last. The aim is to give Digital UK plenty of time to solve any problems early on so they don't cause chaos when they get to the areas where most people live. Digital UK has a postcode checker for more specific information about your area. Apart from the fact that you have little choice, the transition to digital TV offers a number of benefits. The first of these is that you’ll have a much wider selection of channels (up to 44 on Freeview terrestrial) than the four or five available now. You’ll also be able to enjoy digital radio, without the need for a separate DAB receiver, and will also be able to take advantage of Digital Teletext / Ceefax - a much more advanced version of the blocky, slow-loading analogue service you may be used to. The biggest headache about digital switchover for many people will be the need to upgrade or replace their existing TV equipment, which - you should remember - doesn’t just include that old CRT in your living room. It potentially extends to every TV in your home, along with old VCRs, DVD recorders, PC TV tuner cards and others. Every one of them will needed to be connected to some kind of digital set-top box decoder (‘digibox’) if you’re to continue to use them. Millions of devices will be affected. By far the easiest way to upgrade your equipment is to buy Freeview digibox which could set you back as little as £20 with no monthly subscription fee. You can see which one best meets your needs by checking out TechRadar’s reviews. There’s no need to go out and buy a new TV (as some wags would have you believe), although digital switchover does provide the perfect excuse to upgrade - whether you're looking for a digital-ready flat panel set, or a new digital TV recorder, etc. One caveat is that Freeview digital TV through an aerial may not be available in your area yet, so any new equipment may still not work until local TV transmitters are finally switched over in your region. To take out a digital satellite TV subscription with Sky. Prices range from £21 to £45 per month, with a free digibox and £30 installation charge. To take out a digital cable TV subscription with Virgin Media. Prices range from £11.50 to £20.50 per month, plus a one-off installation fee of £150. To get Freesat from Sky - a free-to-air satellite TV service that offers over 200 free-to-air channels with no monthly fee. All you have to pay for is a digital satellite set-top box, which Sky will supply and fit for £150. To get Freesat from the BBC and ITV. This new service delivers over 80 free-to-air radio and TV channels via satellite. All you have to do is cough up for a one-off payment of £50 for a basic set-top box, plus another £80 for installation. Costs for the boxes will be higher if you also want to record your favourite shows or take advantage of Freesat's high-definition programming (around £120). Freesat compatible boxes and advice are available from high street stores like Argos, Comet, Currys and John Lewis. Digital UK is mindful that some vulnerable people will need help with choosing and installing Freeview equipment in their homes and so has come with an assistance scheme to help. This ensures anyone over 75, who is registered blind or who has significant disabilities will receive assistance for a nominal fee of £40. Those on pension credit, jobseeker’s allowance or income support should get assistance free. You can, of course, get high definition content on digital satellite and digital cable now, although you’ll need to make sure you have a compatible TV, and will also have to take out a dedicated subscription, and buy a suitable digibox. Sky HD, for example, offers 10 dedicated channels (including free services from BBC and Channel 4), but you’ll need to spend between £199-£249 for a SkyHD receiver if you already have a Sky subscription, or pony up £399 for Sky HD only. You’ll then have to pay a £10 per month Sky HD subscription (in addition to any other subs you have), plus a one-off installation cost of £60. Terrestrial high definition TV isn’t currently available through Freeview, although government media and telecoms operator Ofcom plans to make four channels available by 2012. The biggest problem, as we see it, is that Freeview HD will require set-top boxes that are compatible with the MPEG-4 standard Ofcom is proposing to use. That means current digiboxes that use the MPEG-2 standard won’t be compatible, forcing you to either upgrade your existing box (if that’s even possible) or to buy a new one entirely.